The color is not as good in the photo as it really should be because for some reason the flash massed it up. I used the kraft as the center with inking around the edges then stamped the sentiment, added red silk flowers and the gold with turquoise butterfly. Last added it all to the turquoise base. I love it. This is so delightful. What a beautiful color combo. 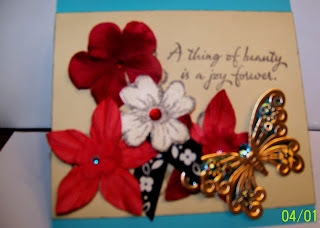 What a beautifully elegant card!!! 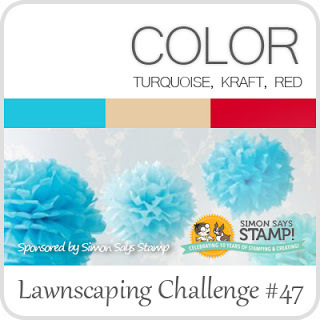 Thank you so much for joining us at Lawnscaping!!! So many great elements on this card. Thanks so much for joining us at Lawnscaping!